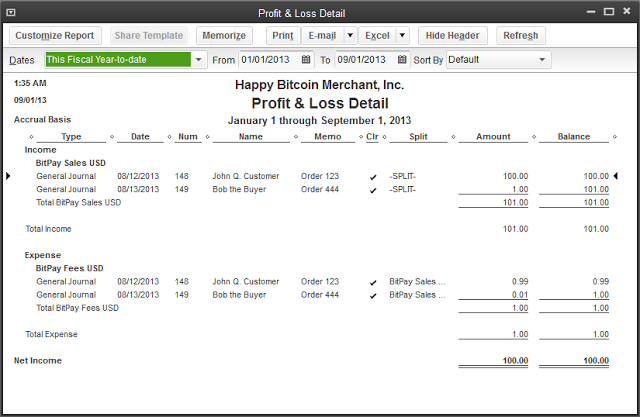 BitPay offers Quickbooks integration to merchants on both our Business and Enterprise plans. Bitcoin sales can be exported from BitPay and imported into Quickbooks. We recommend the setup described below. In Quickbooks, you do not need multi-currency enabled if your home currency is USD, EUR, or CAD, and you are taking 100% settlement from BitPay in that same home currency. To confirm that your Quickbooks is properly configured, a sample file is provided at the bottom of this article. From the menu in Quickbooks, select: File > Utilities > Import > IIF files and import the sample file. You can confirm that the file was imported correctly by noting that My Bank USD shows a balance of $100.00. You can review the G/L to verify Sales Receipts. Edit the transfer to replace My Bank USD with the Bank account in your chart of accounts that received the direct deposit from BitPay. 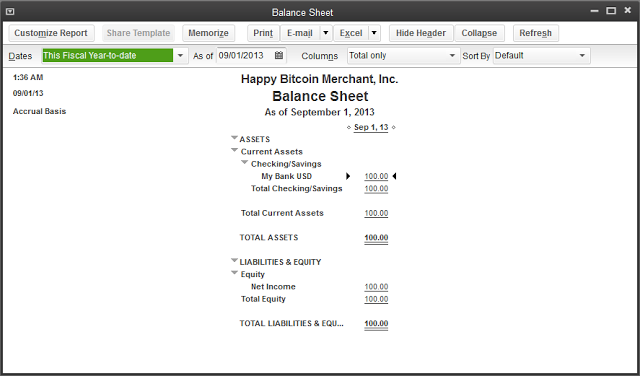 Your BitPay sales are now fully integrated with your financial reports in Quickbooks! Note that if you keep any % of your sales in Bitcoin, this will not be noted in the download. It will prorate the gross sale to only the % of the gross sale which you settle in your local currency. Read the next section “Keeping Partial or All Settlement in Bitcoin” to learn more. To download your BitPay transactions, login to your merchant account at https://bitpay.com. From your dashboard, click on Account Ledger and select your home currency to download. You will need to specify the date range to download, and then choose: Quickbooks IIF file. We should note that Quickbooks does not support multi-currency very well, even in the 2013 edition. Nonetheless, we have used the capabilities of Quickbooks to their current maximum potential. If you take 100% settlement from BitPay in your home currency, you are done! If you keep a % of your BitPay Sales in Bitcoin, follow the next section to import those from your BitPay BTC ledger. The Gross, Net, and Fees are % prorated from the total amount of the sale. Meaning if you keep 10% bitcoin and settle 90% in EUR, your EUR ledger will have an entry representing 90% of the total gross sale, and your BTC ledger will have an entry representing 10% of the total gross sale, with the same Order Number so you can match them up in Quickbooks. These accounts represent the USD value of your bitcoin, at BitPay and also when pushed to your bitcoin wallet. While Intuit’s support for multi-currency doesn’t give all the income/expense reporting needed for bitcoin transactions, it is possible to add your bitcoin wallet into Quickbooks, and mark your digital assets to market price every day or every month. We encourage Quickbooks users to contact Intuit directly and encourage development in the above 8 areas to improve their multicurrency support. 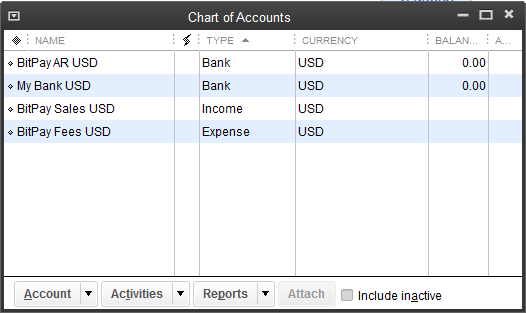 Next, create a new account in your chart of accounts for each bitcoin wallet you want to account for in Quickbooks. Because Quickbooks precision cannot go past 2 decimal places for the quantity, if you want to account for your bitcoin holdings you will need to use millibitcoins (mBTC). The exchange rate for mBTC is the rate for BTC divided by 1,000. Quickbooks does have 8 decimal precision when calculating the rate, but only 2 decimal precision on the quantity. Every day, you will manually need to enter the exchange rate under Company - Manage Currency. The exchange rate is the USD amount pushed to My Wallet BTCUSD divided by the actual number of bitcoins delivered to your wallet, as viewed directly on your bitpay.com BTC account ledger page. Then, manually enter a TRANSFER every day to clear out the deposit from the My Wallet BTCUSD and transfer into My Wallet mBTC. Your wallet should now show the latest deposit in the correct number of mBTC, and on your balance sheet the entire wallet balance will be marked to the current market price. How do I download a CSV of my transaction history? How do I get my 1099-K form from BitPay? How do I send money from my BitPay Card to my bank account?